What I eat in a day is something I normally cover on the last Wednesday of the month over on my channel. Something that is very popular and as such is called ‘What I Ate Wednesday’. I am a very fussy eater and about 90% vegetarian. Plant based foods just seem to suit me and my disease. I guess you could also say I clean eat. I have a healthy and balanced diet. When I am away I eat slightly different, one because of what’s on offer or two because of what I fancy. 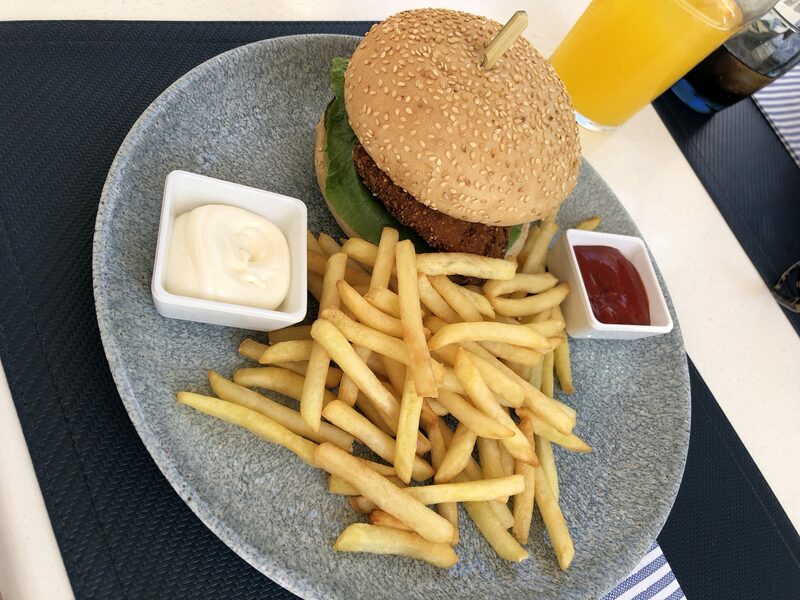 In Mallorca the buffet in our hotel really wasn’t all that and so hard to get a full vegetarian meal let alone a vegetable. If there was a vegetable it would be mixed with bacon or some kind of meat. Or something I don’t like. We were half board which was good for me especially as I could then eat more at lunch time if I wanted to. 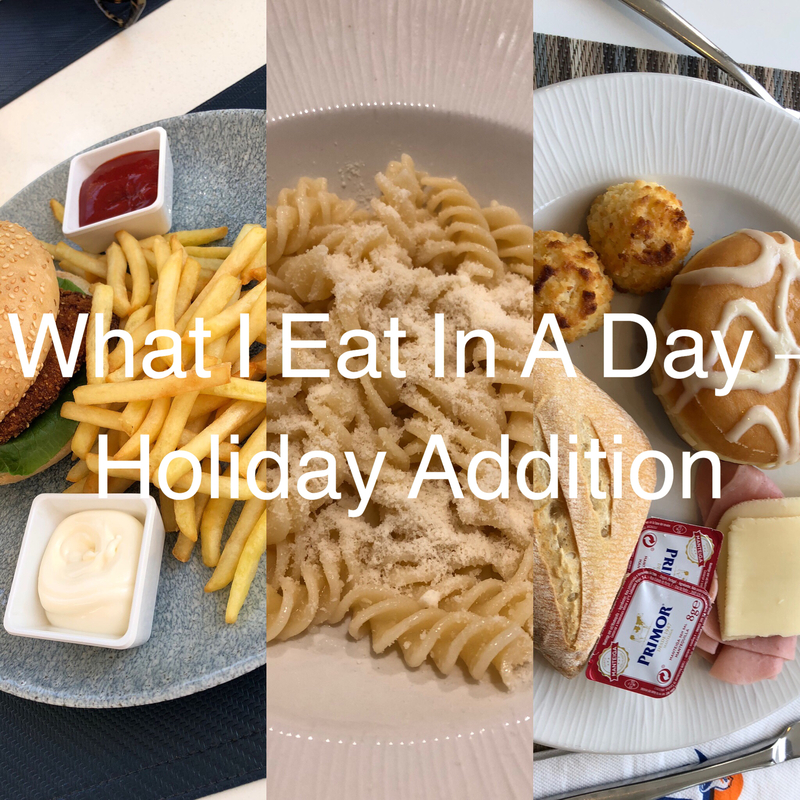 So here is what I ate in a day on a holiday. Starting with breakfast I love pastries and cakes, I don’t have these all the time don’t worry but who doesn’t treat themselves on holiday? So I had a roll or croissant with ham and cheese in. Which was lovely. Then to go with that I had coconut cookie which taste amazing. It was so nice sometimes I went for two. I also went for a half chocolate half plain doughnut and all these we really yummy. 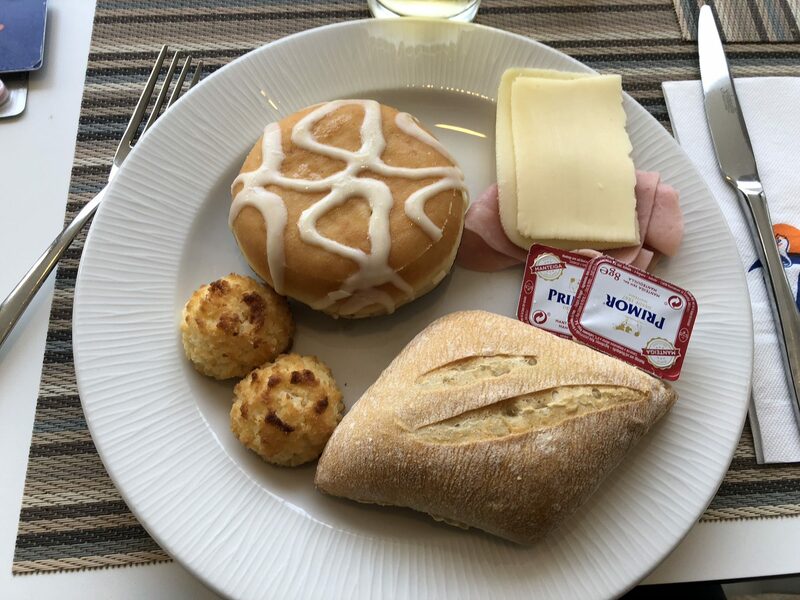 I would say the croissants seemed fresher than the bread rolls. For lunch depending on the weather and on whether the night before dinners was ok I would have a baguette, sandwich or paella. Actually this was on the last day but after many nights of not much food I decided to go for this chicken burger. It was the best meal I had on holiday and I wish we had ate more than ice cream there all week because this was the best meal I had. It was cooked so well that the taste was amazing. The bun was toasted and in there was mayonnaise, lettuce, tomato and gherkin, about 3 pieces of breaded chicken and the chips were decent as well. The plate even came with one pot of ketchup and one of mayonnaise. This is actually something I would like to recreate at home. Every afternoon we would walk down to the beach front also to the restaurant where my burger is from and get ice cream. They had about a choice of 30 flavours and all looked inviting. I tried a few flavours but the best I had was the Kinder Bueno ice cream. Something else I want to recreate at home. It had so much flavour in it, from the chocolate to the hazelnut and the wafer. There was also chucks of chocolate and wafer running throughout the ice cream. I had one scoop which I must say was more likely to be 2 scoops as they are very generous in a waffle cone. So yummy. Dinner was a little bit of a let-down really, I am fussy so maybe that’s why but really being I eat the majority of my main meals as vegetarian. There really wasn’t many options in the buffet. There was a chef cooking pasta 5 of the 7 nights and each sauce wasn’t suitable for a vegetarian. I know I am not fully vegetarian but for someone who is you would have to let them know prior to your stay so they could cater for you. 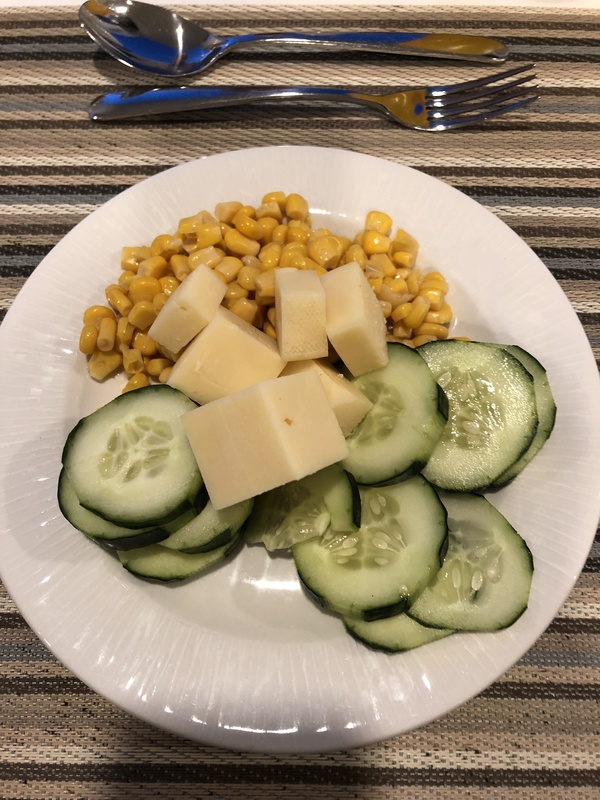 To start with I had sweetcorn, cucumber and edam cheese. This was from the salad bar but most of the foods were mixed where people lent across to get what they wanted to eat. This obviously doesn’t help I am fussy. For main I looked at the hot buffet and some nights were better than others. But mainly fish or beef. Both that I don’t really eat. 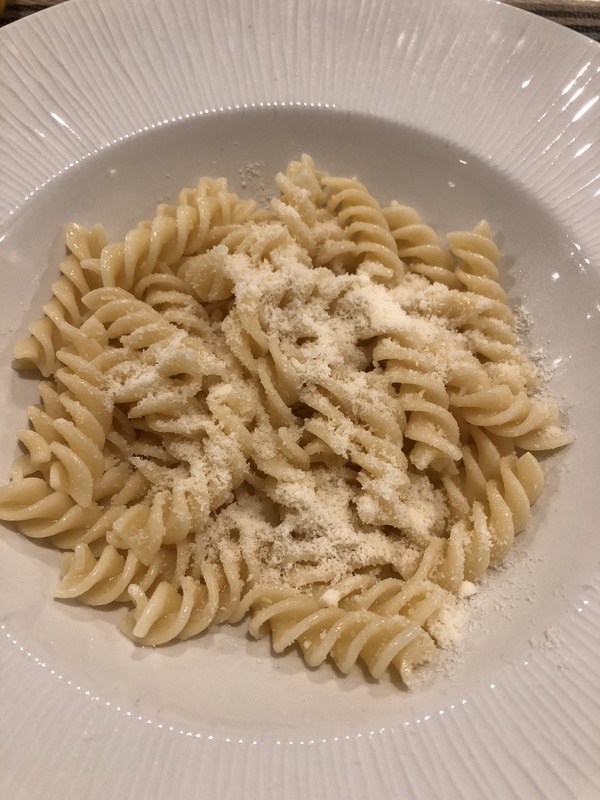 Once I found out I could have the pasta cooked plain for me that’s what I went for. I would then add cheese to it and depending on the vegetable I would have that. This seems really boring and some nights I would of wanted more but was very limited. I didn’t go for pudding because by this point I was full or not in the mood to find something I would eat. I think if I were to go again I would go for a bed and breakfast basis or self-catering because going to the shops and restaurants on the pine walk would have been a much better choice and easier. What do you normally eat whilst away on holiday? Or on a typical Tuesday?